The Roman Canon, sometimes also called Eucharistic Prayer I, is one of several different canons the priest may choose to pray during the Liturgy of the Eucharist. There are four main options, plus several others, but the Roman Canon is the canon with the longest history in the Roman Rite. In fact, it has been prayed almost unchanged for roughly 1500 years. In Latin, the words of a sentence can be placed almost anywhere and still maintain sensibility. Thus, the placement of words is empowered as a manner of conveying meaning. 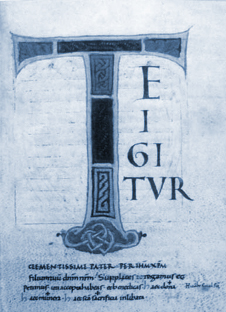 It is not by mistake, then, that the very first word of the Roman Canon is Te (“You”), referring to God. That the prayer begins with Te tells us the orientation of the whole prayer: toward the Father. Word placement commands power in English, too, although there is less freedom in its regard than there is in Latin. What we have been praying since 1973, noticeably, changes the initial focus from Te (God) to We (us). This translation fails to capture the fundamental orientation that is so clear in the Latin and instead, unfortunately, places undue emphasis upon the worshipping community. The new English translation has masterfully restored the essential orientation of this prayer. In addition to reinstating the loving description of our Father as “most merciful,” the placement of the word “you” at the outset of this prayer faithfully accomplishes the same nuance realized by the Latin.